It’s no secret that chemical peels do wonders for your skin; removing dead skin cells and bringing out fresh, new skin from under the first layer. But with our hectic schedules, it’s often difficult to make an appointment at your local salon for a skin boosting treatment. Filorga to the rescue with their own version of a “Chemical Peel” that you can do at home and one that has literally zero downtime! 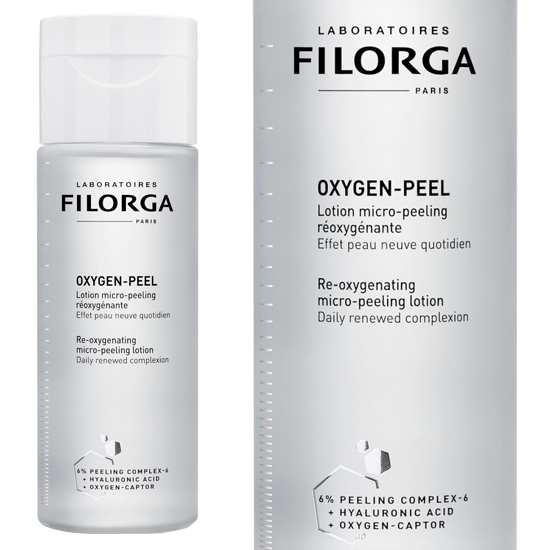 Used daily, Filorga Oxygen-Peel works as a refreshing lotion that gently exfoliates the skin to provide hydration, smoothing and re-oxygenation. It’s loaded with Glycolic Acid, Phytic Acid, Citric Acid, Salicylic Acid, Mandelic Acid and Gluconolactone, all of which provide intense smoothing, as well as Pure Hyaluronic Acid and Filorga’s NCTF vitamin and amino acid cocktail to refresh and hydrate the skin. In addition, the protein molecule Cytoglobin protects the skin during times of oxidative stress. Filorga Oxygen-Peel comes in a really cool applicator, where you hold down the pump with a cotton pad and apply it onto your skin. It almost feels like water on the skin, with no greasy residue and my skin just absorbs it like a sponge. Instantly it plumped up the texture of my skin even though it felt like I had nothing on. I’ve been trying to avoid using any rubbing agents on my skin lately and dissed the toner for a bit, so I’ve been using this one instead of a exfoliating product and as a toner and my skin always feels refreshed and glow-ey after I apply it. Available now from selected Edgars and Red Square Stores. Filorga always blows me away with their at-home treatments – which not only provide products that feel salon-worthy, but with applicators that make you feel like you’re getting the salon treatment without going to the salon! 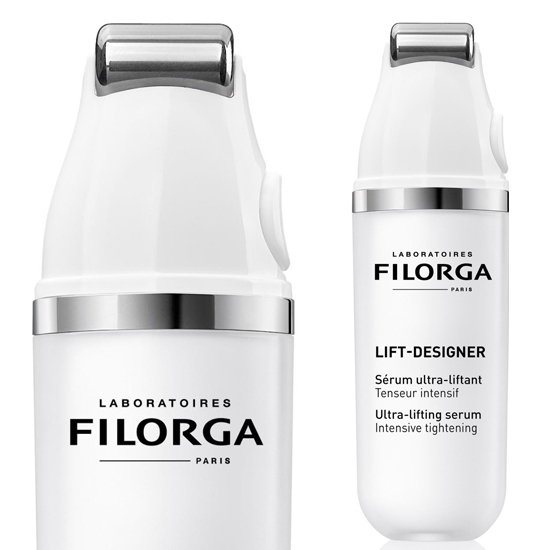 The latest is the Filorga Lift-Designer Serum which is one of three products in their new Lift-Designer range. I’m going to talk about the applicator first, because this pro-anti-aging skincare brand is so just so incredibly innovative when it comes to skincare and the application techniques that make the products work even better. Once you take the lid off, you’ll notice this really futuristic steel roller, which is actually how you apply the product directly onto your skin. Pressing the little pump button on the side, releases the serum and then you just use the built in roller to apply directly onto your skin. This provides a mechanical stimulation to boost the active ingredients of the serum, and the metal feels lovely and cooling on your skin. At the core of the Filorga Lift Designer range is somethingh they’ve called Plasmatic Lifting Factors®, which combines a Plasma Rich in Cellular Factors, Collage and Hyaluronic Acid to your skin with the added benefits of firming, lifting or tightening actions. I’m very excited about these new skincare launches from Filorga. Are you excited to try them out?